Let me sketch out why I’ve taken this as my verse, and maybe it can help you, too. A bit of background info: I’m weaning off some strong meds and it looks like the next little while is going to be tough. At the exact right time, God gave me this verse to be my motto. I thought it fit pretty perfectly. My particular downfall is depression, and so joy and hope are definitely my goals. 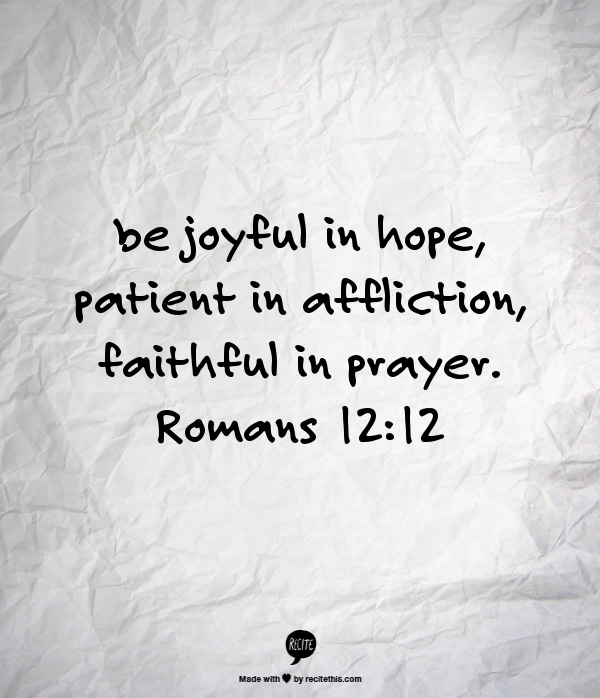 How to be joyful in hope? What does that look like? Knowing I have hope: ultimately my life is in God’s hands and he is strong enough to deal with whatever comes my way. Also that this is a momentary trouble. It has an end point, at which time I will feel better. So I can keep that hope in mind, and cheer myself with the thought. I also really like the idea of “leaning into joy”, a piece of advice someone gave me in counselling. Yes, you get ups and downs, but instead of focusing on the downs, you can focus on the ups. For me it’s particularly relishing a pretty sunset or a sweet hug from my child or a cooling breeze. It doesn’t have to be huge, but there really is power in counting each blessing. What is the hope you can cling to? What are the joys you can lean into? This comes along with hope. Knowing it won’t last forever. As I go through days of nausea, stomach and head aches, brain shivers, and crazy mood swings I can remind myself this will soon be over. I can take steps to increase my capacity for patience, taking care of myself and putting extras aside for a time. What can you do to increase your patience? I know I’m not big enough to handle this on my own. This situation is an easy reminder to rely on the creator of the universe for everything I need. Sometimes it’s not so easy to remember to turn to him. Hopefully I can use this as a training ground for prayer, so that when life is simpler I will remember. Thank you for sharing this. I am having some hard times and this passage will be added to my long list of inspiration.